Omaha Community Playhouse and UNMC in conjunction with Evil Dead: The Musical. Sunday, February 17 – Zombie Apocalypse: Are you prepared? Join Dr. Shawn Gibbs, associate dean for Student Affairs in the College of Public Health at UNMC, as he explores the possibility of a zombie outbreak. How do we prepare? What are the rules from the Center for Disease Control that apply? Dr. Gibbs received his B. S. in Biology from Ohio State University, followed by an M. S. in Environmental Science from University of Cincinnati and an M. B. A. in Agribusiness from University of Nebraska –Lincoln, and then received a Ph. D, in Environmental Science from the University of Cincinnati. His research area is environmental exposure assessment, including environmental microbiology. The focus is on environmental bioaerosals (bacterial, antibiotic resistant bacteria, fungal, viral) from both the indoor and ambient environments. Dr. Gibbs has previously done work and has ongoing projects in a wide range of environmental health topics from decontamination, pesticide exposure, pregnancy outcomes and health disparities. Sunday, March 3 – Zombie-ism: It’s infectious! Shawn Gibbs, Ph.D., associate dean for Student Affairs in the College of Public Health, discusses different types of infection and how they spread. Could a zombie outbreak occur? How fast would it spread? Can zombie-ism be contained? Sunday, March 10 – Real life zombies: They do exist! Real life is often more shocking and horrifying than the creations of our imaginations. Dr. Michael McCaskill, assistant professor in Environmental, Agricultural and Occupational Health, will discuss the toxicology of “bath salts,” designer drugs that cause “zombie-like” behavior. Dr. McCaskill received his B.S. from the University of Florida in 1999, a M.P.H. from the University of South Carolina in 2002, and a Ph.D. from Florida A7M in 2009. Dr. McCaskill’s research interests include toxicology, metabolic pathways, zenobiotic induced reactive oxygen species, mediated protein, hormone and vitamin dysmetabolism. 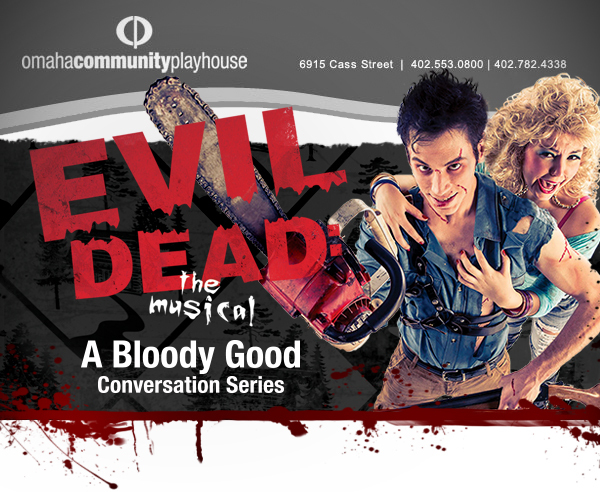 The conversations will occur after the Sunday matinees of Evil Dead: The Musical and are free to those attending that day’s performance. No reservations are necessary for the conversation. Tickets to Evil Dead: The Musical are $40 for adults, $24 for students (K – 12 and full-time undergraduates). This conversation series is offered free and is open to the public. For tickets, visit omahaplayhouse.com, call 402-553-0800 or visit the OCP Box Office. In its 16th year, First Stage Theatre Academy will examine the world of Imagination. Participants will be challenged in this two-week camp to dive deeper into the theatrical experience. Workshops and seminars will address everything from stage combat, dance and music to writing for the stage, acting styles, mask work and audition techniques. Additionally, students will prepare for an original production performed on OCP’s Hawks Mainstage for invited family and friends. Please note there is only one session this year, space is limited so register now! $100 dollar deposit due at time of registration. Don’t forget we have a variety of summer camps during the month of June for our younger campers; for more information, click here. To register for First Stage, click here, call (402) 553-4890, ext. 131 or email dchapman@omahaplayhouse.com. 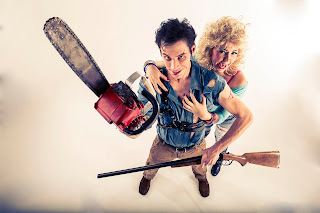 Evil Dead: The Musical - blood, gore and more! Everyone is buzzing about Evil Dead: The Musical, the Splatter Zone and all the fun that goes along with it. But what has the cast excited about the show? They’re just dying to tell you! Were you a fan of the movies in the Evil Dead series before auditioning for this show? My older brother and I used to watch Army of Darkness all the time. He even had a movie poster up in his bedroom, and I think, a t-shirt. I don’t even think I understood the plot – I just thought it was so cool that funny people came out of the ground and that guy had a chainsaw for a hand. Why did you want to audition for Evil Dead: The Musical? 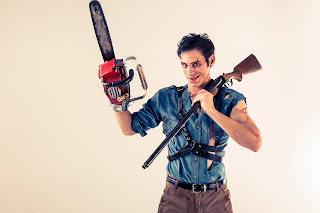 I remember how excited I was when I heard about Evil Dead: The Musical off-Broadway. And the splatter zone sounded so cool! 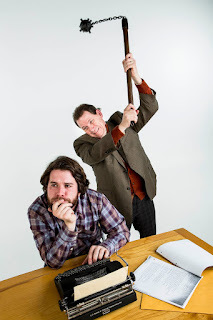 When I heard the Omaha Community Playhouse was doing it, I knew it would be literally off the chain…saw. What is your favorite part about this show? It’s a tight piece with so much to catch that the audience will literally have to sit on the edges of their seats in order to eat it all up. And for those in the splatter zone – wow. They’re going to be catching more than quips and punch-lines, for sure! What is your favorite part about your character? I honestly get to have so much fun. Every moment in every scene is basically my favorite. Why did you want to audition for Evil Dead: The Musical? 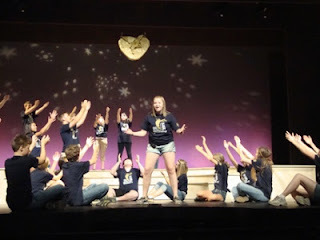 It is a musical that is full of fun and energy, and I wanted to be a part of a project like this. Also, my friends and I love zombie movies, so I was really hoping to get cast. Linda is this goody-goody that is quite innocent in the beginning, but when she turns to the dark side, a whole new personality takes over her, and I enjoy playing with that contrast. Did you see any of the movies in the Evil Dead series before auditioning for this show? You bet; all three! I loved them! Evil Dead 2 is my favorite. The idea of having the opportunity to kill zombies or be a zombie on stage was definitely on the actor bucket list for me! Were you a fan of the movies in the Evil Dead series before auditioning for this show? Army of Darkness was a movie I've liked since I saw it as a kid. Is it cliche to say "the splatter zone?" He can never get a word in edgewise. Poor guy. But it makes memorizing lines a snap! What advice would you give someone who is coming to this show? Join us! Ha ha, oh the puns are even getting to me. But seriously, come ready to laugh and be covered in copious amounts of gore. It'll be a good time. I promise. Evil Dead: The Musical plays in the Howard Drew Theatre Feb. 10-March 17, Thursdays-Saturdays at 7:30 p.m. and Sundays at 2 p.m. Tickets are $40 for adults and $24 for students. For groups of 12 or more, tickets are $29 for adults and $18 for students. For tickets, visit omahaplayhouse.com, call 402-553-0800 or visit the OCP Box Office. Indicate whether or not you want seats in the Splatter Zone! And for more bloody, good fun, join us for the Splatter Bash on Feb. 15. Omaha Community Playhouse's 21 & Over program presents Crumble (Lay Me Down, Justin Timberlake). Come cozy up in the splatter zone of Evil Dead: The Musical. Then enjoy drinks, bar snacks and music from 31st Productions with DJ Josh Mullady that will have your limbs flying around the room. Nothing says, “Happy Valentine’s Day” better than Evil Dead: The Musical! Post Show Event: 9:30ish – 11:30 p.m.
For tickets call the director of sales at (402) 553-4890, ext. 147 by Wednesday, February 6. This event is for people ages 21 and older. Deathtrap may be the perfect show for Matthew Pyle’s Omaha Community Playhouse directing debut. This murder thriller is full of plot twists and turns in which every character is engaged in on-stage combat at some point during the two acts. As a fight choreographer who studied stage combat under some of the nation’s most accomplished teachers, Matthew clearly has the credentials for this directing challenge. Prior to moving to Omaha, Matthew worked as an actor, director, fight choreographer and teacher at many schools and theatres around the country. He studied stage combat at Carnegie-Mellon University and later studied with K. Jenny Jones, the first woman Fight Master – the highest rank granted by the Society of American Fight Directors. So, how does his expertise assist him in directing this play? Although Deathtrap is Matthew’s first directing gig at OCP, he has shared his acting and fight choreography talents at OCP for the past few years. He has choreographed violence in OCP’s productions of A Streetcar Named Desire, Steel Magnolias, Flyin’ West, Boom, The Fantasticks and August, Osage County,as well as Neighborhood 3 and Mauritius for the 21 and Over series. Onstage, Matthew has been seen as Steve in Becky’s New Car, a doctor in A Streetcar Named Desire, Kyle (the UPS guy) in Legally Blonde and Steve in the 21 and Over reading of Neighborhood 3: Requisition of Doom. 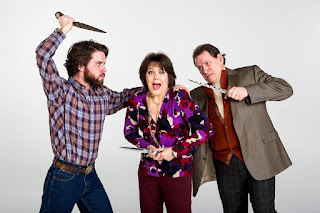 Experience the thrill of Deathtrap Jan. 18-Feb. 10 in the Howard and Rhonda Hawks Mainstage Theatre. Show times are Wednesday–Saturday at 7:30 p.m. and Sunday at 2 p.m. Tickets are $35 for adults and $21 for students. For groups of 12 or more, tickets are $23 for adults and $15 for students. On Wednesday, Jan. 23, tickets for that night’s show are $10 at the Box Office after 4 p.m. (cash or check only). Enjoy the arts with a Metro Arts and Culture Pass! If you are a season subscriber to the Omaha Community Playhouse, in the month of January, you can receive $4.50 tickets and 20% off concessions at Film Streams (for all regular screenings) . You can also buy one ticket and get one ticket free to the Harlem Gospel Choir or "Mayberry" at The Arts Center.